Everyone needs some alone time to recharge and regroup. Time to put the phone away and unplug. Today's fast-paced lifestyle and day-to-day stress has us all craving some down time. Imagine yourself in a soothing spa where the only decision that you have to make is what kind of massage you should select. A vacation or a business meeting in the International Drive Resort Area offers a chance to check into a full service spa and reenergize…or at least a chance to fit in a treatment that will help relieve some of the tension. Give yourself a break. Escape to one of the area’s full-service spas or have a massage at one of the many hotels in the area that will set up an appointment that fits into your schedule. Whether you have a few days or a couple of hours. Enjoy world-class pampering that blends exotic Balinese and Indonesian healing traditions with North American influences. There's also a special massage just for the Mother-to-Be and a special Sports Massage to ease overly active bodies. Red Rice, Jasmine Cempak and Ylang Ylang are some of the exotic elements used during traditional body cleansings. Guests are promised a "nèu you" with packages such as Day of Nèu, Nèu & Improved and Brand Nèu.The spa features a number of Asian influences as seen in the cutting-edge Hadashi oriental-style barefoot massage, Warm Lava Shell Massage and Bamboo Shoots massage. 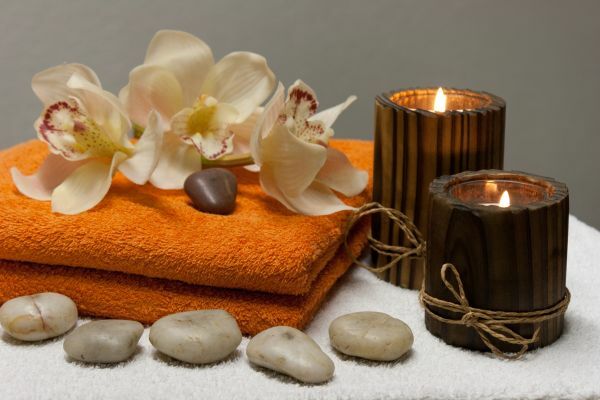 Relaxation begins for mind, body and soul through a variety of facial, massage and body pampering treatments. One signature service is the Phyto-Marine Wrap, an aromatic, herbal, cocoon-like wrap that uses nourishing clay and essential oils to relax and alleviate stress. Developed in harmony with its natural surroundings, the headwaters of the Florida Everglades. Signature treatments such as the Everglades Scrub and Body Wrap and the Orange Blossom Facial with Native Tea Peel draw on the restorative powers of the area's indigenous fauna, incorporating maple, citrus and cedar scents to indulge guests in the warm, woodsy feel of nearby Shingle Creek. The perfect place to stop between meetings or time exploring the city, indulge in a range of treatments and salon services at The Spa, with a wellness philosophy that is inspired by our guests: We strive to personalize your treatment to meet your unique needs and preferences. Book a massage, facial, or body scrub, or visit the salon for a manicure, blowout, hairstyling, or makeup services. You'll feel like you’ve been transported to a tropical oasis in the middle of Florida. Essentials and Escape Journeys feature both results-oriented and locally inspired therapies. Soak up the luxurious citrus aromas of Orange, Lemon, Lime, Coconut, Papaya and Mango during a spectacular service at Hilton Orlando. For more spa choices, check here. No matter where you are staying in the I-Drive area, you will be able to book a day, a package or a single treatment at one of the many spas. Be sure to make reservations in advance for treatments. Individual spas are happy to customize a perfect day of treatments or a quick in and out service depending upon your schedule! Talk to the therapist about the treatment. Are you tired from long meetings? Recovering from a long flight? Dehydrated? Let the therapist know where the aches and pains are so they can pay special attention. Book treatments in advance. Plan ahead and select your services so that you will get the treatments that you want. Ask about the spa’s cancellation policy. Arrive early. Take advantage of amenities such as sauna or arrive early to make the most of your experience. Depending on the type of treatment or package you purchase, most spas allow you to use the sauna, steam room and showers, as well as their “relaxation” or “meditation” rooms, before your treatment. Relax! Close your eyes and allow your mind and body to be quiet. Breathe deeply to help release tension, and remember this time is just for you!